Images of the effects of water pollution are often shown to raise awareness of the consequences of pouring untreated wastewater into rivers and oceans. On this occasion we present an original idea by three Taiwanese students that goes that much further. For their graduation project, 3 students from the National Taiwan University of Arts, Hong Yi-chen, Guo Yi-hui, and Zheng Yu-di, chose to make a problem visible: the contamination of aquatic ecosystems. They collected 100 samples of contaminated water from different parts of Taiwan. And what did they do with them? Create popsicles! 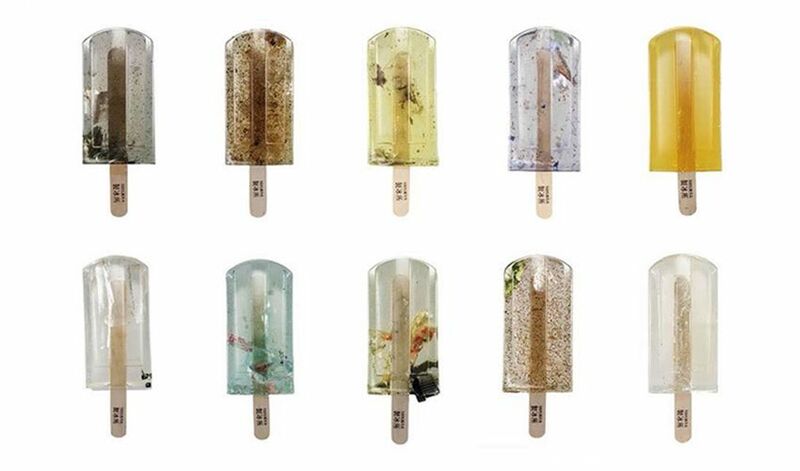 Their project, 100% Polluted Water Popsicles, is a powerful demonstration of the range of substances that end up in water, from cigarette butts and plastic packaging to leftover oil, bottle caps, etc. The result: popsicles of different colours and with a variety of prints, which you can see on the project’s Facebook page.